Systematic Art is pleased to offer a wide range of standoffs, accessories and fine art mounting hardware ideal for windows, retail stores, trade shows, airports and public spaces. Explore our diverse collection of products for art gallery hanging systems. The (Fixed) Point-To-Point ceiling to floor kit is ideal for both commercial and residential applications providing a secure means of suspending pictures, signs, posters and banners. The ceiling to floor kit is available in both 10' and 20' cable lengths and comes with all the necessary hardware to install the tension set. The articulated brass made Self-Gripping point-to-point tension cable kit gives users the ability to suspend objects in various configurations and with great flexibility. The Self-Gripping Tensioned cable kit can swivel up to 180 degrees and in two directions. 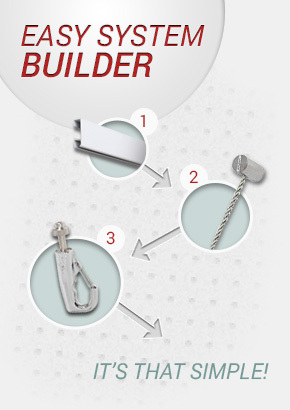 The aluminum Wall-to-Wall tension kit gives users the ability to securely suspend objects from wall to wall and is ideal for high traffic areas. The Heavy-Duty articulated Point-To-Point tension cable kit with its fixed 3 hole anchor plates and rotating pivot head is ideal for heavy loads and perfect for displaying pictures, signs, a point of purchase and banners in high traffic areas. 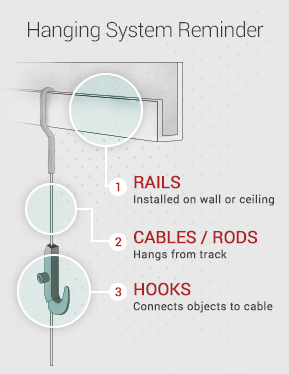 This item comes complete with all the necessary hardware to install the tension kit from either ceiling-to-floor, ceiling-to-wall and wall-to-wall. Available in Polished Chrome and Silver Satin Anodized. The horizontal single sided shelf support is used to suspend both glass and wood shelves.